Christiane Jablonowski is an Associate Professor in the Department of Climate and Space Sciences and Engineering. Her research is highly interdisciplinary and combines atmospheric science, applied mathematics, computational science and high-performance computing. Her research suggests new pathways to bridge the wide range of spatial scales between local, regional and global phenomena in climate models without the prohibitive computational costs of global high-resolution simulations. In particular, she advances variable-resolution and Adaptive Mesh Refinement (AMR) techniques for future-generation weather and climate models that are built upon a cubed-sphere computational mesh. Variable-resolution meshes enable climate modelers to focus the computational resources on features or regions of interest, and thereby allow an assessment of the many multi-scale interactions between, for example, tropical cyclones and the general circulation of the atmosphere. Dr. Jablonowski organizes summer schools, dynamical core model intercomparison projects, teaches tutorials on parallel computing and climate modeling, develops cyber-infrastructure tools for the climate sciences, and has co-edited and co-authored a book on numerical methods for atmospheric models. 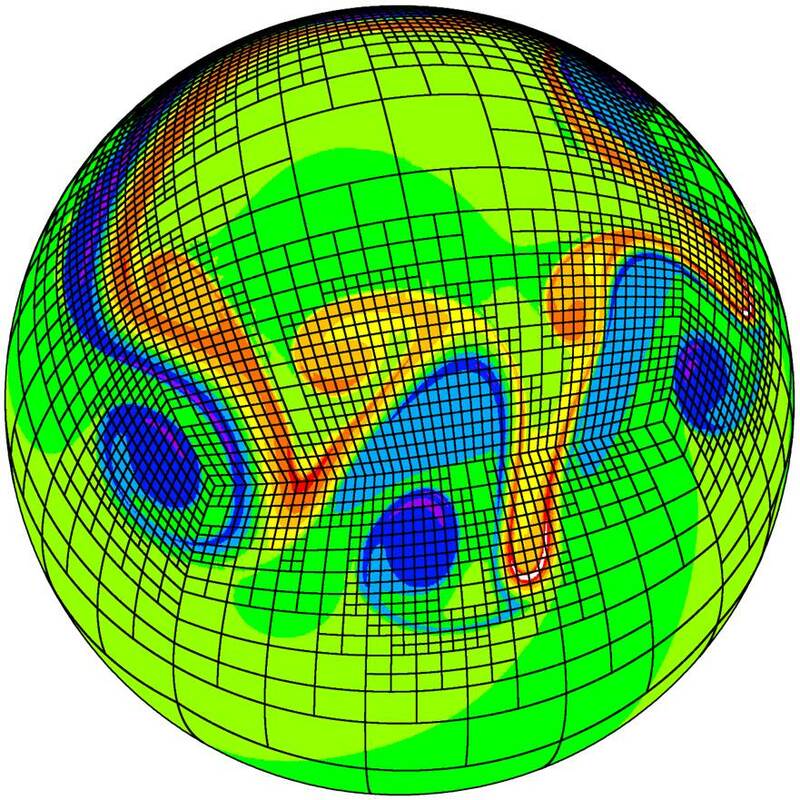 Snapshot of a 2D atmospheric model simulation showing a developing wave that is dynamically tracked by a block-structured and adaptive cubed-sphere computational mesh. Blue and red colors denote a clockwise and counterclockwise rotational motion, respectively.